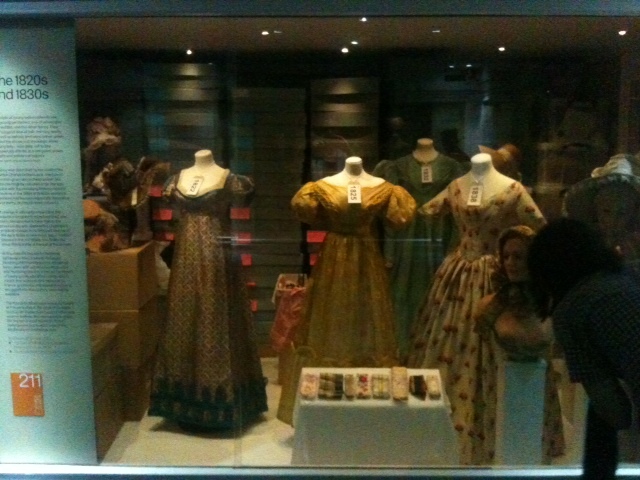 A highlight of this summer holiday was a visit to the Fashion Museum in Bath, a museum small in size but with a grand scope and a substantial collection of female costume dating back to the 17th century as well as modern womenswear fashion and couture. Whilst I remembered to record voice memos and take snapshots (blurry and underlit misrepresentations, I’m afraid, and I do apologize for the poor quality) during my visit, I later regretted not doing a videoblog on site, as this might have been the best way to capture and share the experience. My errand with this post is not an analysis or presentation of the museum as such – Marie Riegels Melchior has already done a good job at that in her report on fashion museums for Designmuseum Denmark – but rather a few personal comments on the things that stood out or inspired me, that is, considerations on a visitor experience. 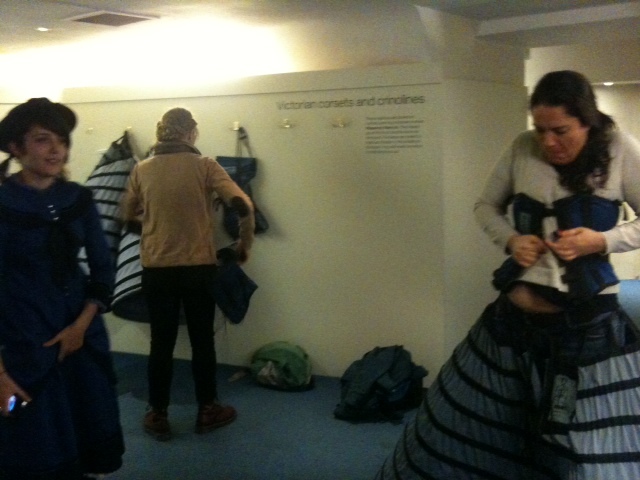 Having spent hours and hours in the costume department at the V&A in the past, I was somewhat surprised to realise that actually I wasn’t all that interested in marvelling at the beauty and the details of the dresses on display. Perhaps all those visits to my Kensington haven along with all the books on fashion and costume I have collected over the years did finally manage to quench my thirst for brocade and bias cut? So really I wasn’t that excited to see ‘yet another’ pannier/empire line/flapper dress (exquisite as they were). Which in itself gave me food for thought – if even someone like me, with a specialist interest an a life long infatuation with fashion and dress, is not that interested in a fashion exhibition, then who is? Then again, I’m sure there’s many more like me out there who are still hungry for more, as I might also be on another day. And I guess there will also be egyptologists/archeologists/geologists who are less than enthused by ‘yet another’ canopic jar/stone axe/fossil, which wouldn’t be an argument for not showing these in a museum. Still, going back to fashion exhibitions, perhaps curators also experience some form of faille fatigue, needing, and therefore curating, bigger kicks in the form of fantabulous couture blockbuster shows to get their fashion fix. But let’s get back to Bath, which did have displays that pushed my buttons. 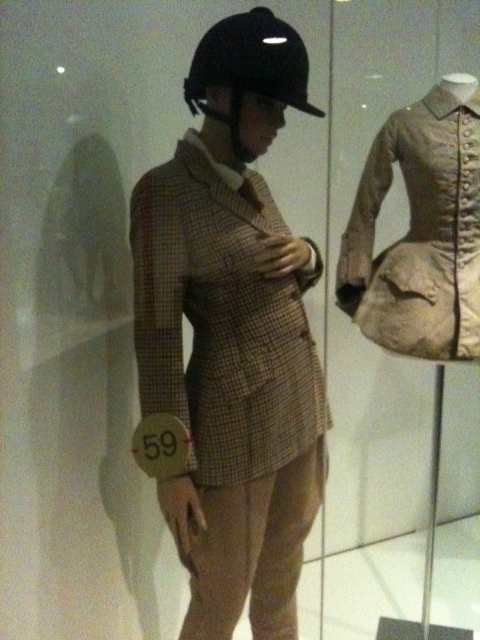 Take this riding costume from the current sports display. No sartorial wonder, but just like the one Jill manages to find in a pawn shop in the first book of the series (Gitte-bøgerne, in Danish (and btw, That’s 30 years ago, and I still recall that passage?)) that I used to devour as a kid, dreaming that one day I too would have my own pony, and be kind and pretty and win people’s hearts and all the gymkhanas. In other words, all my girly dreams and aspirations in textile form. The lure of fashion in a nutshell. 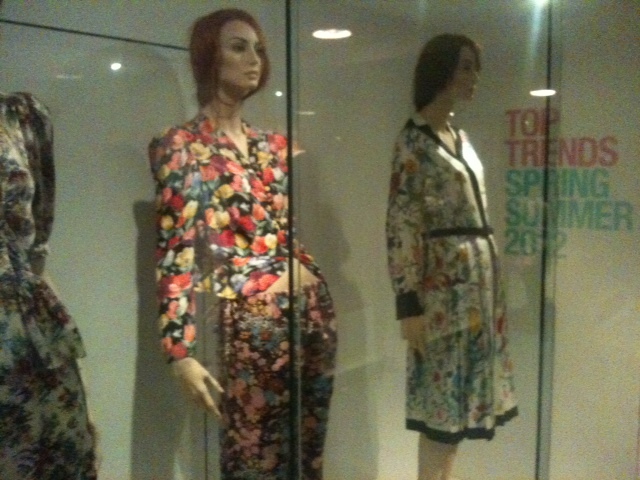 Apart from this ensemble, I was mainly inspired by the museum’s many diverse takes on mediation. Like the dressing up activities, which catered to adults and children alike. And judging by the buzzing, giggling and posing for photos going on as I passed through, this really hit a spot. It was social and fun, playing to the inner princess, and at the same time a physical learning experience that would help you relate to how dressing up in corsets and crinolines would have been like, and thus appreciate the collections in a new way. brought both to life, and with the museum being situated in the Assembly Rooms in the middle of Bath with all its regency splendour, it was almost an experience of Gesamtkunst. Brilliant. A similar take was used in the display of 20th century fashion, were minute descriptions of the objects were omitted, to be replaced by associations with cultural references. Another interesting idea was the display of current trends using collection items, to illustrate the cyclical nature of fashion. Finally, I liked the ‘Dress of the Year’ concept, each year inviting a front figure of fashion to select an outfit that captures the Zeitgeist. Only I was a little bemused by the use of batting to line the floor, giving the crammed display more of a home made santa village feel than the Ice Queen glamour intended to compliment the gown by Sarah Burton for McQueen.